Woodstock Farm is a country home estate created by Cyrus Lester Gates, a prominent Fairhaven parks and public works leader and philanthropist. The farm was built between 1905 and 1925, partly as a family home and partly as a showpiece on scenic Chuckanut Drive. The City of Bellingham acquired Woodstock Farm in 2004. Woodstock Farm is just a few miles from my home and I go there often. I created this piece that will be used for promotional and fundraising purposes. My original file has 100 different layers in Photoshop. I saw this technique used by a photographer I follow, Niall Benvie. He calls it a Deconstructed Landscape. This approach gives the viewer a feel of many different aspects of a place as opposed to one single grand landscape shot. Although it was very time consuming to put together, I have many other places I would love to showcase like this. You can find more information about Woodstock Farm here. You can read more about Niall Benvie’s Deconstructed Landscapes here. 30 May	This entry was published on May 30, 2012 at 09:13. 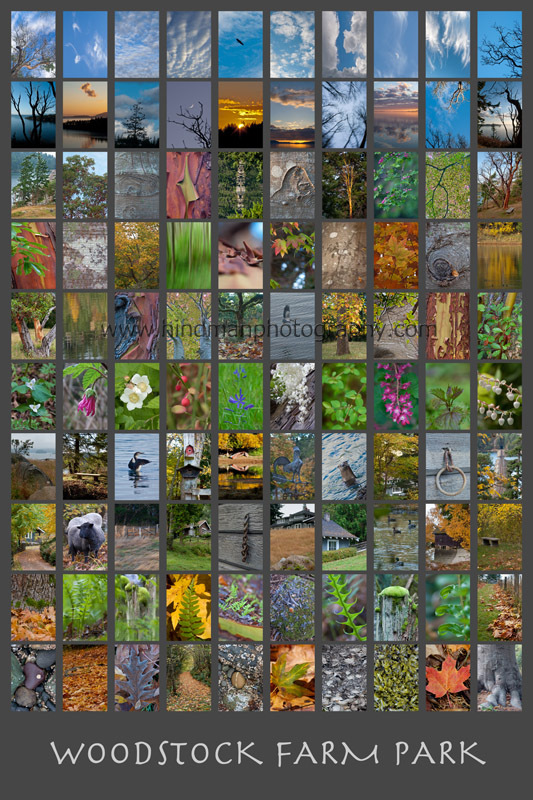 It’s filed under Birds, Flowers, Nature, Pacific Northwest, Whatcom County, Woodland and tagged Arbutus, Bellingham City Park, Chuckanut Bay, Chuckanut Drive, Douglas Fir, farm, history, inspiration, natural history, Pacific Madrone, Whatcom County, woodland. Bookmark the permalink. Follow any comments here with the RSS feed for this post. I like the deconstructed view, and the interesting presentation, although I guess I would like the landscape as well to get the whole picture. So neat to know so many places are so close to be able to visit and learn. I love this! A reminder to slow down and notice the details in life. Miss you, Susa!